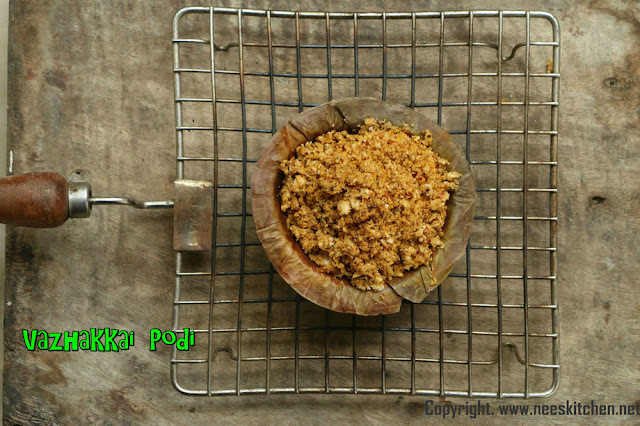 Vazhakkai podi or Plantain powder is one of the healthy ways to use plantain in our cooking. It consumes very less oil as compared to Vazhakkai fry curry. The aroma of burning the plantain in fire is very nice.I generally do not prepare this, as the dish always fails to me when mixing the dhal powders with plantain. So I wanted to learn this time properly from my mother. The dish is very simple to make with these steps. 1. Wash the plantain and burn it in the gas. 2. Let it cool and peel the skin and chop into pieces. 3. Take a pan add oil,hing,drychilli and roast. Keep it aside. 4. In the same pan add toor dhal and fry for 2 mins. 5. Add Urad dhal,tamarind and fry until a nice aroma comes. 6. Switch off the gas. 7. Blend all the ingredients including salt and except the plantain into a coarse dhal powder. Take out and keep it aside. 8. Add the chopped plantain and grind for just once or twice until the plantain gets crushed. You may add one or 2 spoons of dhal powder to help blend nicely. 9. Mix it with the remaining dhal powder and give one more blend in the mixer and transfer it to a bowl for serving. Vazhakkai podi is ready to be served with raita. We made senai pachidi or elephant yam raita. Hing powder can be used in place of hing cake.